Successfully Added iPazzPort Wireless Keyboard - 57 Key, QWERTY Layout, Touchpad, Mic + Speaker, USB Dongle, 400mAh Battery to your Shopping Cart. If you're looking for an easy way to interact with all your gadgets such as TV boxes, tablet PC's, car stereos or home computer and have full control from the other side of them room then look no further. When it comes to portable all in one keyboards the iPazzPort mini keyboard can do it all. Operating on the 2.4GHz frequencies this wireless keyboard has a 10-meter range and is suitable for use with many systems such as Windows, Android, iOS as well as a Linux systems such as Debian-3.1，Redhat-9.0，Ubuntu-8.10，Fedora-7.0 and more. The includes USB receiver dongle means you needed worry if your computer doesn't operate on the 2.4GHz range as the dongle makes it compatible with most devices. The 57 keys on this QWERTY keyboard cover everything you need for to easily type away in comfort and its ergonomic layout makes interactions a breeze. With a large touchpad, the keyboard can be used for direct writing, drawing or to control the on-screen pointer, all with the tip of your finger. A built-in microphone and speaker mean you can even use the keyboard for VoIP calls or chatting online and for more privacy, there's an earphone with mic included for those confidential calls. A built-in 400mAh lithium ion battery will bring an astonishing amount of user time, typically around 2 weeks and as much as 1 month in standby. Perfect for those business trips or holidays, what's more with its compact form and light weight the keyboard can easily slide into your laptop case or jacket pocket. 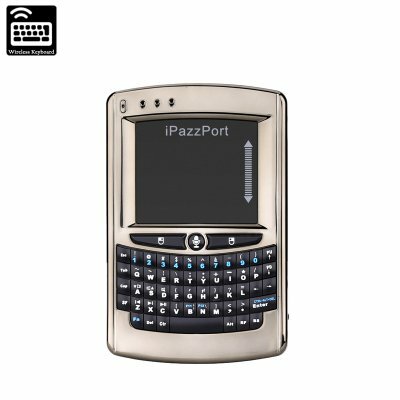 The iPazzPort 57 Key QWERTY keyboard comes with 12 months warranty, brought to you by the leader in electronic devices as well as wholesale Wireless keyboards and computer accessories..